Developing countries generally wait an average of 20 years between when a vaccine is licensed in industrialized countries and when it is available for their own populations. Economic, infrastructural and scientific hurdles all contribute to this long delay. The Global Alliance for Vaccines and Immunization (GAVI) is a partnership between many public and private organization, including UNICEF, WHO, the Bill and Melinda Gates Foundation, members of the vaccine industry and NGOs. GAVI was formed in 1999 to address the long delay between vaccine availability in industrialized countries and developing countries. Scientific advances that would help make more vaccines available in developing countries include the development of temperature stable vaccines, development of vaccines that required less than three doses to immunize and the development of needle free methods to administer vaccines. I will limit this discussion to pneumonia and tuberculosis (which isn’t solely respiratory) for the sake of brevity. Pneumonia is the leading global killer of children under five, responsible for almost 1.6 million deaths per year. In that vulnerable population, it is a disease of poverty and occurs most commonly when a child’s still-developing defense system is weakened by malnutrition, air pollution, co-infections with HIV/AIDS and measles, and low birthweight, with 43 million cases for children in India alone. Pneumonia is the leading cause of death in children worldwide. Pneumonia kills an estimated 1.2 million children under the age of five years every year – more than AIDS, malaria and tuberculosis combined. Pneumonia can be caused by viruses, bacteria or fungi. Pneumonia can be prevented by immunization, adequate nutrition and by addressing environmental factors. Pneumonia occurs when the sacs of the lungs, known as alveoli, become filled with pus and fluid, limiting oxygen intake and making it hard to breathe. This post is a continuation of Pediatric Diseases in India (part 4). 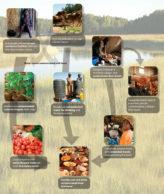 The image “Pathways to Diarrhea” comes from the CDC. This post is a continuation of the Pediatric Infectious Diseases in India post. Diarrheal disease is the second leading cause of death in children under five years old. It is both preventable and treatable. Diarrheal disease kills 1.5 million children every year and account for >10% if child mortality in India. Globally, there are about two billion cases of diarrheal disease every year. Diarrheal disease mainly affects children under two years old. Diarrhea is a leading cause of malnutrition in children under five years old.